The Chicago Bears addressed most of their roster concerns via free agency this offseason, but one of the positions that still needs to be addressed is the defensive end/ edge rush position. With the departure of Willie Young, Pernell McPee, and Mitch Unrein, the team has left itself thin of defensive end capable of rushing the quarterback. 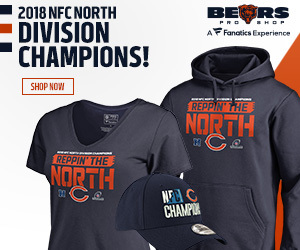 Sure, they have Leonard Floyd entering his third year but he hasn’t proven to be able to stay healthy. Signs hint to the team using their first or second round pick in this year’s draft on a player who can rush the passer, preferably from the defensive end position. If the Bears decide to add a pass rusher in the first day or two there will be some interesting options available to them. Bradley Chubb is the overall consensus top defensive player in this year’s draft. Many pundits have projected him as a perennial Pro-Bowler and All-Pro for his NFL career. He dominated while at N.C. State as he recorded 10 sacks last season with three multi-sack games. Chubb proved his ability to dominate inside the trenches as he posted 23 tackles for losses, and had six games of multiple tackles for losses. One of his more impressive games came against Notre Dame who has two of their starting offensive linemen projected as first-round draft picks. In the game, Chubb had three tackles for losses and one sack. The chances of Chubb being available when the Bears select with the eighth overall pick are highly unlikely unless the team gets very lucky. If he did fall to the Bears, it would give the team one of the best pass rushing groups in all of the NFL. Leonard Floyd and Akiem Hicks would have another high-quality pass rusher to assist them, whether be drawing more blocks to free them up or take advantage of the blocks that are targeting them. The team’s starting defensive line of Hicks, Chubb, and defensive tackle Eddie Goldman would be considered one of the best overall in the NFL. Heading into the draft, Davenport appears to offer more potential based on his raw talent rather than his football instinct and skills. Davenport has frightening good speed for a defensive end his size. Many of his sacks last season came because he was able to beat the opposing tackle off the snap and broke up plays before they could develop. Last season, he recorded eight and a half sacks along with 17 tackles for losses demonstrating his ability to get off the ball and into the backfield. Davenport would be a quality pick for the Bears if they were to trade out of the eighth spot, but he would be similar to when they drafted Floyd as he would be a project. His mixture of size and speed would be valuable for the Bears defense as they could line him up at the outside linebacker position for a few plays to utilize his quick speed. If teams were to double team Hicks, Davenport has the speed to be offensive linemen on the edge one on one to sack the quarterback. Similar to Davenport, Boston College’s Harold Landry has incredible speed for a defensive end that allows him to break up plays before they can begin. Landry was Boston College’s premier pass rusher last season as he recorded five sacks. although a bit undersized for the position, he still was able to dominate in games as he had a three-sack game against Virginia Tech last season. If he is able to add size once in the NFL, he does have the ability to be highly impactful with his speed. Landry would be another quality choice if the Bears trade down in the first round as with his speed, he could be a hybrid player who could both play linebacker or defensive end. He would provide the defense with depth and the ability to draw up exotic blitz design with his speed and athleticism to line him up at multiple positions. Defensive coordinator Vic Fangio was able to do the same with defensive end/ linebacker Willie Young who originally was seen as only a defensive end suited for a 4-3 defense. Florida’s Taven Bryan offers more potential rather than proven football achievements. His athleticism for a defensive lineman is very similar to that of J.J. Watt. While at Florida this past season, he had four sacks and six tackles for losses, but his speed and strength along the line shows on game film. His ability to line up at end and tackle makes him a highly valuable prospect as he provides a team with depth and versatility. Bryan is projected to be drafted in the late portion of the first round, but he falls to the second round would be a prize possibility for the Bears and their second-round pick. He has the ideal size for a defensive lineman in a 3-4 front and would highly benefit from lining up along size Hicks and Goldman. It would be very intriguing to see how he could develop under both Fangio and defensive line coach Jay Rogers’ tutelage. Ohio State has been a defensive prospect factory the last few years producing many first and second round talents, including their latest defensive end Sam Hubbard. Hubbard replaced Joey Bosa as OSU’s defensive line pass rush specialist as he registered seven sacks last year including two-and-a-half sacks in the Cotton Bowl against USC. He recorded 20 total plays for losses in a Big Ten Conference known for consistently having some of the best offensive linemen in all of college football. Hubbard is another prospect who could be a quality fit for the Bears if they chose to address the position in the second round. He does have the size to be a defensive end in a 3-4 front and could potentially have a lot of sacks with his style of play. Many of his sacks at OSU came from him being in the right position and allowing the play to develop. Unlike other defensive prospects, Hubbard had a lot of sacks in which the quarterback came to him when stepping up in the pocket or being unable to find an open target. He would make for a nice rotational defensive end and could clean up a lot of pressures created by other Bears defenders.